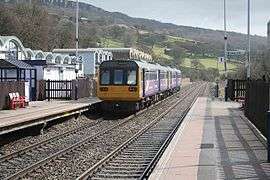 From Sheffield, trains head down the Midland Main Line through the south west of the city to Dore and Totley, where the Hope Valley Line branches off to run through the Totley Tunnel (the fourth-longest in England). From the western portal of the tunnel, the line runs through Chinley, then splits. The northern branch runs via New Mills toward Manchester Piccadilly. The southern branch passes through the Disley Tunnel before merging with the Buxton line and then heading to Stockport to join the main line to Manchester. Passenger services on the line are currently operated by Northern (previously Northern Rail and First North Western), East Midlands Trains (previously Central Trains) and TransPennine Express (previously First TransPennine Express and Arriva Trains Northern). In the early 1980s, proposals were put forward to convert the Piccadilly-Belle Vue-Rose Hill/Marple section of the Hope Valley Line to light rail operation for the proposed Manchester Metrolink system. While construction of Metrolink went ahead, the Hope Valley line was not included in the system completed in 1992. 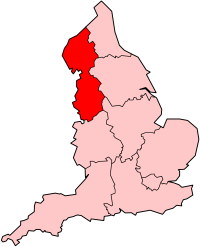 When in 2000, proposals for a large-scale extension of Metrolink were announced by the government, these still did not include conversion of the Hope Valley line; but subsequently, planning documents from Network Rail and from the Greater Manchester Passenger Transport Authority have suggested that this route might be appropriate for tram-train operation, and as such it was suggested to the Department for Transport as a possible location for a national tram-train pilot. Network Rail, in partnership with South Yorkshire ITA, will redouble the track between Dore Station Junction and Dore West Junction, at an estimated cost of £15 million. This costing is based on four additional vehicles in traffic to deliver the option, however, this will depend on vehicle allocation through the DfT rolling stock plan. This work will be programmed for between 2009 and 2016, subject to funding, is conjunction with signalling renewals in the Dore/Totley Tunnel area. 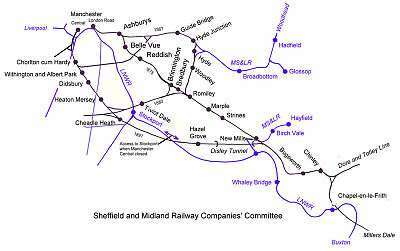 Other proposals include freight loops in the Hope and Grindleford areas, again, subject to funding, in order to fit in either a peak-busting, or all-day (07:00–19:00) hourly Manchester - Sheffield via New Mills Central service, by extending an existing Manchester - New Mills Central service. It is hoped to start work in 2017 and have extra services running in 2018. ↑ "Yorkshire & Humber RUS Appendix 4 - Options Appraisal" (PDF). Network Rail. ↑ "Improving the railway at Dore and Grindleford - Northern Hub - Network Rail". www.networkrail.co.uk. Retrieved 2016-04-21. ↑ "Hope Cement Works Railway". sinfin.net. Retrieved 3 April 2016.